Every apartment needs some place to keep the scones. For outside relaxing, eating, and surreptitiously spying on the neighbors. 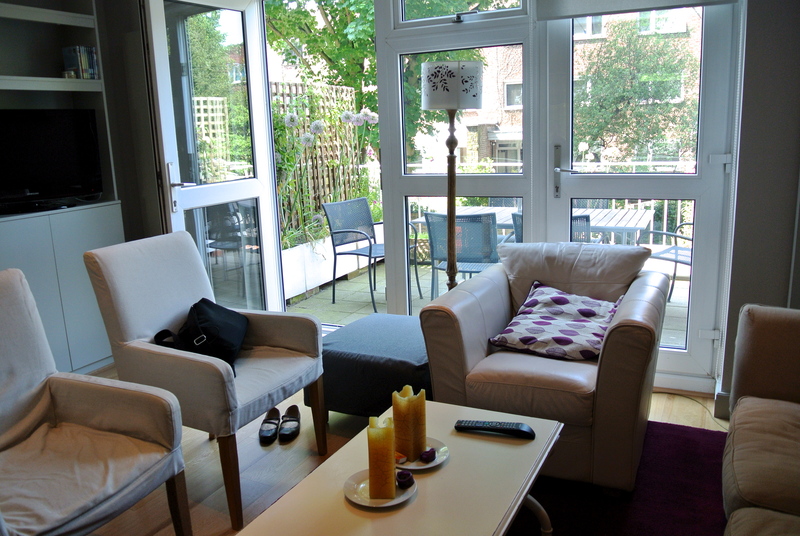 Our first morning in London, we woke up in a lovely apartment in Holland Park in west London. After a late breakfast on the terrace, we walked above ground to under the ground. 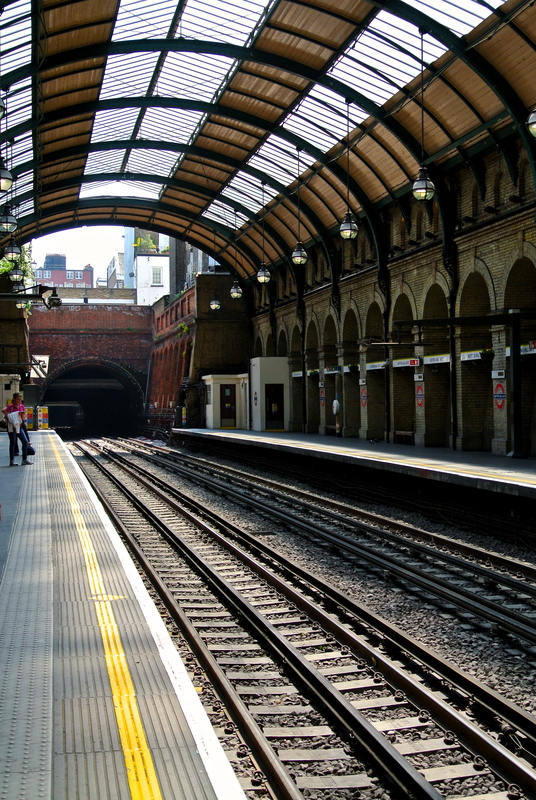 Londoners called their rapid transit system the Tube. In a better world it would have gotten the name from travelers who were pushed out the door of a crowded train during rush hour and felt the way toothpaste feels when it is squeezed out of the tube. Alas and alack, the hole story is that the Tube merely refers to the tunnels the trains travel throughout the town. Our vacation is going to head down the Tube any minute now. 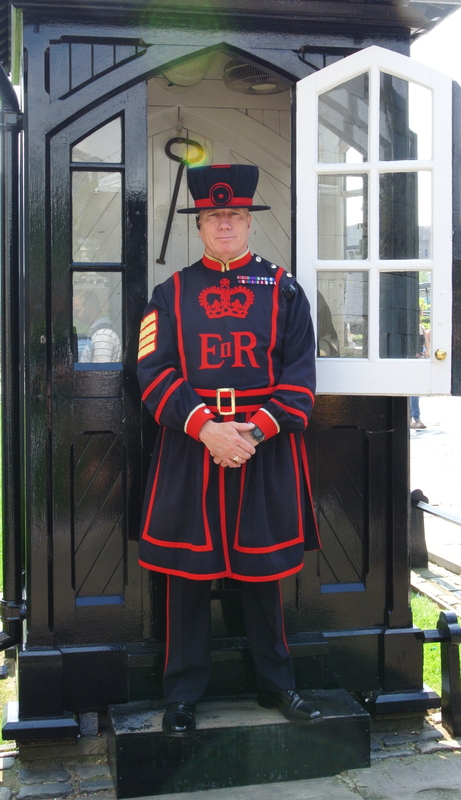 We arrived at the Tower of London and went on one of the guided tours led by a man wearing a Beefeater uniform. Most of the time I understood what the tour guide was saying, but my daughter said she needed to focus on his face and see his gestures to follow. At one point, after she attended to the grandchild and turned back, she lost her concentration and told me all she could hear was “blaah, blaah, blaah” (British English for “blah, blah, blah”). We spent hours exploring the buildings, walking through the exhibitions, and viewing the crown jewels. The ancient castle, built not long after the Norman conquest in 1066, so near the financial center of the city contrasts with the modern London skyscrapers, the Gherkin (30 St Mary Axe), a tubular building that looks like a spiffy rocket ship taking offices where no office has ever gone before; and the Shard, a glass pyramid 72 stories high that will soon allow people from all over the world to look down on London. From the Tower we tally hoed over to what we all told the grandchild was London Bridge, except it wasn’t. 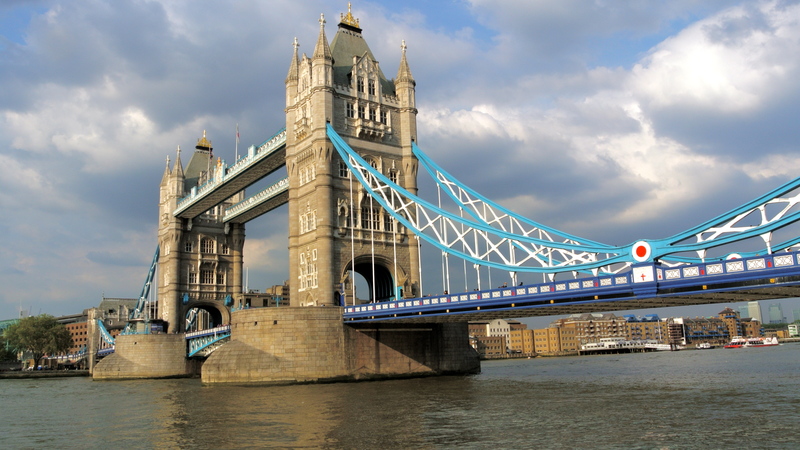 Go ahead and laugh: we all thought that Tower Bridge was London Bridge. We based it on the fact that it is a bridge and it is in London. Later, on our river tour, we saw the real London Bridge, a modern concrete and steel bridge in industrial strength gray that replaced the original falling-down one. I didn’t even take a picture. Inside the British Museum: Let the gawking begin! 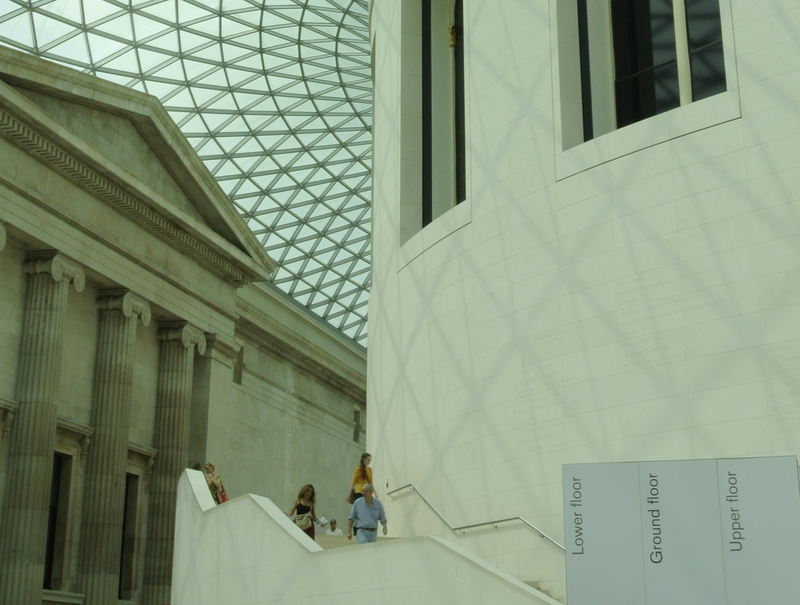 After relaxing away the morning, we spent the afternoon in the British Museum admiring their gawk-worthy exhibitions. Although the grandchild did well in our museum visits, we tried to include opportunities to run and play, so in the early evening we went to the Kensington Gardens to the Diana Memorial Playground. When we got to the entrance, however, the child didn’t want to go in. Oh sure, there’s a pirate ship inside, swings, slides, climbing equipment, and sand; but, at the gate, near the concession stand, one can stalk PIGEONS! Since by that time in our journey we were well-trained and prepared, we carried dry bread and rolls to feed them. 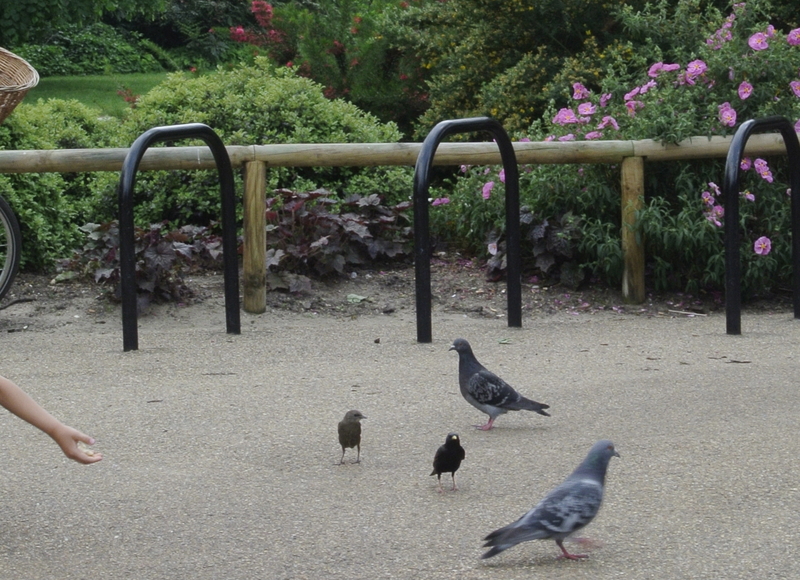 For about an hour, the child followed after the pigeons and coaxed them into coming within arm’s reach. Over and over the small hand would reach forward; the pigeons would draw near, and then…fly just out of arm’s reach until more crumbs were offered. Whoever said that small children have a short attention span has never been around small children and pigeons. Eventually we coaxed the child into the gates of the playground with small bribes and promises of treats, much as the child had done with the pigeons. We got no further than the pirate ship sailing in its sea of sand. After an hour of pirating, our bellies, unaccustomed to such long neglect, finally insisted that we go back to the apartment and make pesto pasta. We didn’t hear another word from them until the following morning when they reminded us that we were in the land of scones. As always, the pigeons are wonderful! The grandchild would love you, Kate. Oh, I miss London. Thanks for giving me a little glimpse. There’s a lot of it to miss. Thanks for reading. There’s more than one bridge in London? Who knew? I certainly didn’t. Thank you for not knowing. It comforts me. From a fellow American who now calls London home, welcome! Hi. First, I like your hat. Second, I just went to your website and saw the lovely box of fruit and vegetables. I’m trying hard not to be jealous. Third, I look forward to reading about your life in London. You beefeater looks just like my beefeater. You suppose it’s the same fellow? Loved your photos. Again. They are colorful uniforms, aren’t they? The man may very well be a career Beefeater, so maybe we saw the same one. The photos are lovely – I like the slideshow. The apartment looks spiffy. I am not sure that’s the correct use of spiffy? If it’s not I meant to say it’s very nice. 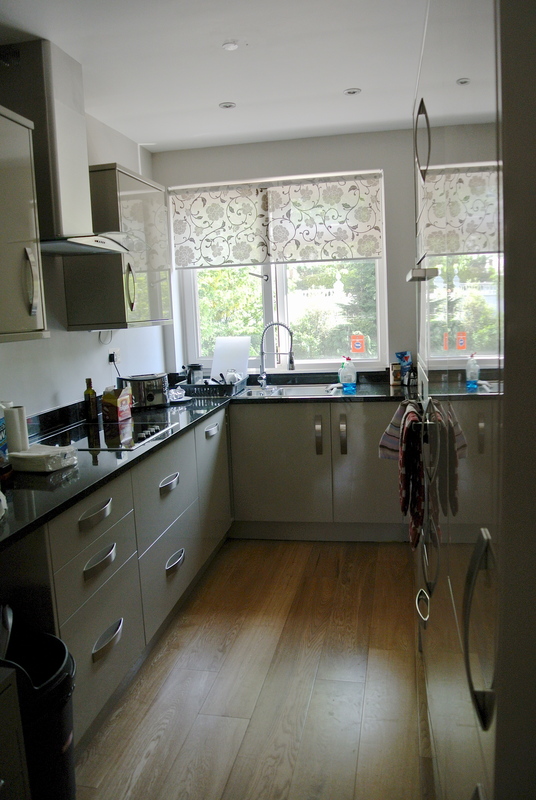 It was a very nice apartment. And I always use “spiffy” to mean very nice. What a great post! Lovely pix. The apartment is awesome! Thanks, Susan, we enjoyed staying in the apartment. It was so easy to walk everywhere and it was very close to one of the Underground stations. Love that apartment as much as the one in Paris. I will have to get more information about how to travel like that. You are a better adult than I when it comes to children and pigeons. To me, it is like letting a child play with a rat. You were all so patient and understanding. I would have been all “NO! Get away from that filthy thing!” Your way is so less traumatic. We were fascinated by the tube and the repeated warnings to “Mind the Gap”. If you’re planning to spend some time in a city, renting an apartment is a good way to go, especially if a number of people are traveling together. Hotel costs add up and then you tend to eat out most meals. I realize that many people consider pigeons to be flying rats. I’m not overly fond of them, but I loved seeing the delight in the grandchild. Some of the gaps between the platform and train were quite large, so the warning isn’t a bad idea. For us Americans, it sounds so very, very British. Ah, London. I was there last year on a trip and got STUCK IN the tube’s door. When I say this, I mean the door closed on me and wedged me in. I was awfully frightened that the vehicle was going to depart with me still flailing around half in-half out like a tangled fish. On the same trip, I got separated from the group and had to catch the tube on my own, not being very sure of my stop, which was frightening. Also, those steep escalators that they have in the underground are the WORST. On the same trip (again) they’d broken down and whilst walking up them, I felt as if I was holding up a queue (being slow, as I am), so I tried to do a silly little jog up them, tripped and fell over. A crowd gathered to see if I was alright, bleeding, I said that I was (they’re sharp!) before trying to do the same thing again and falling over – again! London bears many memories of embarrassment for me aaha. I love the museum of natural history and the V&A gallery ;D Your apartment looks lovely 😀 digs in London aren’t cheap! Hi, olletron. I have missed you. I like your London stories; they were probably not funny when they were happening, but the way you tell them is funny. And yes, the escalators are extremely steep and long, very long. Thank goodness I was never forced to choose between scones and my children. We just got back from our year in London and even with no kid, it took us a lot longer to get to all of the stuff you did in two days! Part of the problem of living there, you think you have all the time in the world, and there’s always the interruption of working! have a ball! I was thinking that laughter is the best medicine before I got to this one… which had me rolling in laughter while picturing the child chasing the pigeons while ignoring the posh playground, and then More of the same after that until I got a tummy ache from laughing so hard. That’s just as bad as the child that gets the really expensive toy in a large box for Christmas and then plays all day in the box while totally neglecting the really expensive large present. I suppose howling like a banshee was a little bit of an over reaction to this scene. I will just have to remember from now on that like all medicines, laughter is best when taken in reasonable doses. I’m glad you liked the post and that it made you laugh. You are exactly right about the grandchild’s fascination with pigeons – the box the toy comes in is often more interesting than the toy itself. I enjoyed seeing the care and concern for the birds that the grandchild displayed – it’s not a bad characteristic to foster. Oh, do I love that apartment. 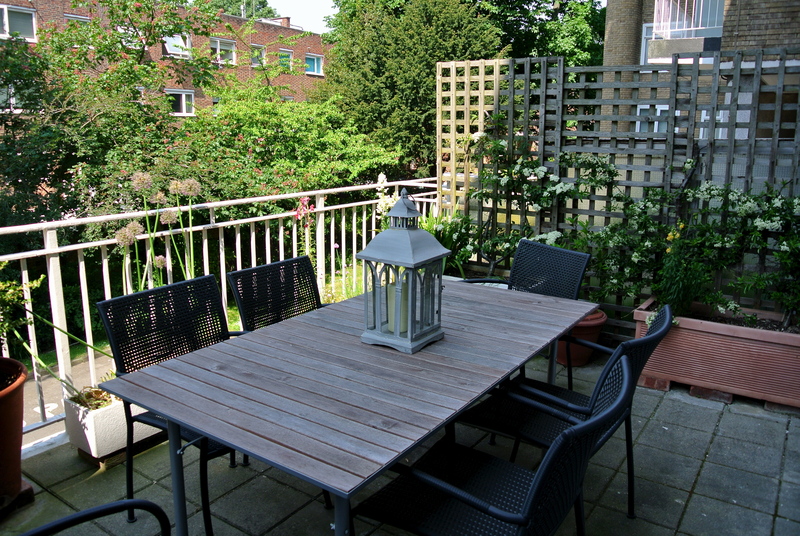 Especially the little outdoor dining-and-spying area. Perfect! Isn’t that lovely? The grandchild wanted to eat out on the terrace every meal we had at the apartment. I’m glad you like the pictures, and I hope you get a chance to visit London soon. Make sure to write about it on your blog. And here I thought a Gherkin was a pickle. And wasn’t the orginal London Bridge sold and reassembled in Arizona? I continue to gawk in admiration over your quarters. I looked at that building many times, and I couldn’t see any resemblance to a pickle. I’m glad I’m clearly not the only pigeon-fancier left. You would get on very well with my grandchild.